In Thailand you can’t get a decent bottle of champagne for less than around Bt. 3,000. If you want something with a bit of class like a Pol Roger or Piper-Heidsieck, we’re talking about Bt. 4,000 baht and upwards. Champagne is expensive because apart from the burden of tax, the production is influenced by the choice of grapes, where they’re grown, the quality of the harvest and the time-consuming, complicated and expensive process known as the méthode champenoise. Even if you don’t speak French, that shouldn’t be too tricky to translate. Of course, there are cheaper alternatives and you’ve probably seen them lining the supermarket shelves. Cheap sparklers are made in much the same way as fizzy drinks, in which still wine is zonked with a dollop of carbon dioxide. European wines made using this charmless process are obliged to use the phrase “aerated sparkling wine” or “added carbon dioxide” on the labels. They might not sound especially appetizing, but there are dozens of them around and a logical choice if you’re on a tight budget. If a bottle of sparkling wine is priced at under Bt. 1,000 it’s almost certainly aerated. 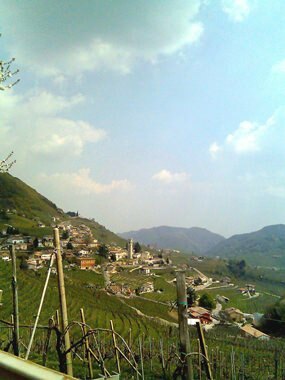 Vineyards at Valdobbiadene (Photo: Mruzzene). However, there is a middle way, known as the Charmat Method in which the secondary fermentation takes place not in the bottle like Champagne, but in stainless steel or glass tanks. The well-known Italian sparkler Prosecco is produced using the Charmat method, because the short tank fermentation preserves the freshness of the grapes. Prosecco comes from Italy’s Veneto region, up in the north-east of the country. The temperature of sparkling wine is important and they’re best at between 4-9°C (39-48°F) or slightly above refrigerator temperature. If in doubt, colder is safer. After opening, stick the bottle in a wine bucket containing ice and water and if possible, leave it corked until it’s time to taste it. If you don’t manage to finish a bottle of sparkling wine at one session, you can leave it in the fridge for a short time if you can manage keep the air out. There’s no way you’ll get the cork back in again because it expands so much when it’s taken out, but you can buy plastic air-tight stoppers with a pull-down lever that effectively seal the bottle. I’ve found that by re-sealing in this way, the wine stays fresh and the bubbles remain active for up to a couple of days. The name looks a bit daunting so perhaps we’d better decode that first. Mionetto is the name of the company, founded in 1887 by Francesco Mionetto in the small village of Valdobbiadene in North East Italy. Prosecco of course is the style of the wine, produced from vineyards among the hills north of Treviso. They’re usually crisp, dry wines with a generous dose of acidity. 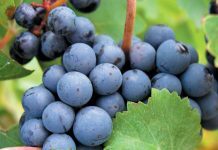 The expression DOC is a quality assurance classification and the word brut is usually applied to a sparkling wine that is quite dry with less than twelve grams of sugar per litre. There we are. Easy, wasn’t it? The wine is a pale gold colour with aromas of apple and a touch of citrus, peach and pomelo. I thought I could pick up hints of dill and oregano in the background. As expected, the wine is zesty and refreshing on the palate with quite a bit of well-balanced acidity there too. It’s a lively young sort of wine with a delicate touch of white fruit on the taste and a surprisingly long clean, dry finish. At just 11% ABV it would make an excellent apéritif but would also make a good partner for things like vegetable soups, mushrooms or barbecued fish with a richly flavoured sauce. Prosecco used to be the name for both the wine and the grape. Confusingly, Prosecco is also the name of a village near Trieste where the grape may have originated. Or not, as the case may be. 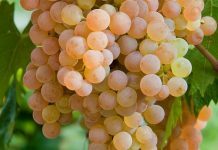 Then the Italian authorities changed the regulations and ever since 2009, the Prosecco grape has been known officially as the Glera. 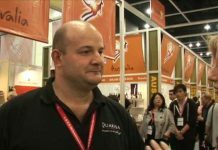 The reasons for the change are purely technical and not especially interesting, but few things are simple in Italian wine culture. Glera is not one variety but several and in the Euganean Hills, the grape goes by its local synonym Serprina. If your budget doesn’t stretch to the Mionetto, let alone real champagne, here’s a good budget sparkler produced by Siam Winery. It’s a very light gold colour with a plentiful supply of bubbles. There’s a lovely fresh, fruity aroma of peaches and passion fruit with citrus and herbs in the background. It’s dry and light-bodied, with a lively refreshing mouth-feel, plenty of fruit up-front and a zesty dash of acidity that gives the taste a refreshing bite. There’s also a long, dry finish with fruit and peppery overtones and it actually tastes quite Champagne-like. The wine originates in South Africa’s Breede River Valley and it’s been blended in Thailand with a small quantity of local fruit wine. But don’t let that put you off, because this light-hearted easy-drinker would be terrific for any social event. At just 12.5% alcohol, it would make a lively pre-dinner drink too, but be sure to serve it really cold. I know this tends to subdue the aroma but the wine will soon warm up. Of course, you can drink it with food if you want, but I think sparklers are invariably better on their own, enjoyed with lively conversation. The bottle has a sensible plastic stopper, so if you don’t finish the wine, you can bash the stopper back and put the bottle back in the fridge. This way, the wine will keep its fizz for a couple of days. Far be it from me to encourage dishonesty, but if you conceal the label with a tasteful white cloth, your friends might assume that you’re dishing up The Real Thing.